Exit 15. Turn left onto Route 67 South. Park is less than 1/2 mile on the left. Exit 15. Turn right onto Route 67 South. Park is less than 1/2 mile on the left. Stay on Route 67 South through Southbury. Park is approximately 1/2 mile past I84 overpass on the left. Park is on Route 67, just before reaching Main Street in Southbury. Watch for condo complex on left as you approach Southbury. Park is approximately 1/2 mile further, on the right. If you reach I84 interchange, you passed it. Exit 15. Turn right, go to next light, turn left onto Main Street South (opposite the Southbury Plaza, K-mart). Follow approx. 1/4 mile to 1st light and turn right onto Poverty Road. Follow to stop sign. School is diagonally across on left. Proceed straight through stop sign and park behind school on the left. Exit 15. Turn left, go to third light, turn left onto Main Street South (opposite the Southbury Plaza, K-mart). Follow approx. 1/4 mile to 1st light and turn right onto Poverty Road. Follow to stop sign. School is diagonally across on left. Proceed straight through stop sign and park behind school on the left. Coming into Southbury on Rt 67, turn right onto Rt. 6 East and follow to second light at Southbury Plaza (K-mart). Turn right onto Main Street South. Follow approx. 1/4 mile to 1st light and turn right onto Poverty Road. Follow to stop sign. School is diagonally across on left. Proceed straight through stop sign and park behind school on the left. Rt. 6 East into Southbury. At second light in Southbury (Southbury Plaza, K-mart) turn right onto Main Street South. Follow approx. 1/4 mile to 1st light and turn right onto Poverty Road. Follow to stop sign. School is diagonally across on left. Proceed straight through stop sign and park behind school on the left. On entering Southbury, at fifth light, turn left onto Main Street South (opposite the Southbury Plaza, K-mart). Follow approx. 1/4 mile to 1st light and turn right onto Poverty Road. Follow to stop sign. School is diagonally across on left. Proceed straight through stop sign and park behind school on the left. Exit 16. Turn right, go past the light and the Mobil station and proceed north on Route 188 approx. 3/4 of a mile. LMES is on the left at the corner of North Benson Road. Exit 16. Turn right, go past two lights and the Mobil station and proceed north on Route 188 approx 3/4 of a mile. LMES is on the left at the corner of North Benson Road. Coming into Southbury on Rt 67, turn left onto Rt. 6 and than an immediate right onto Bucks Hill Road. Follow up hill approx. 2 1/2 mile to 4-way stop sign and turn left onto Old Waterbury Road. Follow down the hill, and turn left at traffic light. Drive past the Mobil station and proceed north on Route 188 approx. 3/4 of a mile. LMES is on the left at the corner of North Benson Road. On approaching Southbury, turn left onto Bucks Hill Road (just before the light at Rt 67). Follow up hill approx. 2 1/2 mile to 4-way stop sign and turn left onto Old Waterbury Road. Follow down the hill, and turn left at traffic light. Drive past the Mobil station and proceed north on Route 188 approx. 3/4 of a mile. LMES is on the left at the corner of North Benson Road. On entering Southbury, get onto I84 East. Follow one exit, to Exit 16. Turn right at end of exit, go past two lights, past the Mobil station and proceed north on Route 188 approx. 3/4 of a mile. LMES is on the left at the corner of North Benson Road. 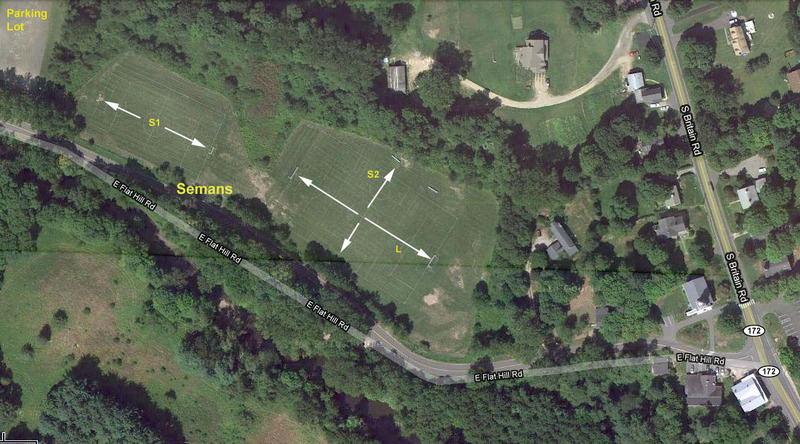 Field A is for U13/U14 sized Goals. 5. 200 SOUTHFORD RD is on the left. The Park Entrance is the Driveway just before the Fire Station on the Left. 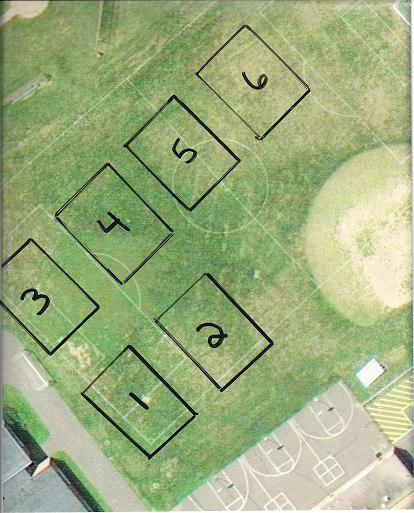 Field B is the U11/U12 goal size. Exit 15. Turn right, go to next light, turn left onto Main Street South (opposite the Southbury Plaza, K-mart). Follow Main Street South approx. 1 1/2 miles. School is on the left just past the town library. Drive around the left side to the back for the field. Exit 15. Turn left, go to third light, turn left onto Main Street South (opposite the Southbury Plaza, K-mart). Follow Main Street South approx. 1 1/2 miles. School is on the left just past the town library. Drive around the left side to the back for the field. Coming into Southbury on Rt 67, turn right onto Rt. 6 East and follow to second light at Southbury Plaza (K-mart). Turn right onto Main Street South. Follow Main Street South approx. 1 1/2 miles. School is on the left just past the town library. Drive around the left side to the back for the field. Rt. 6 East into Southbury. At second light in Southbury (Southbury Plaza, K-mart) turn right onto Main Street South. Follow Main Street South approx. 1 1/2 miles. School is on the left just past the town library. Drive around the left side to the back for the field. On entering Southbury, at fifth light, turn left onto Main Street South (opposite the Southbury Plaza, K-mart). Follow Main Street South approx. 1 1/2 miles. School is on the left just past the town library. Drive around the left side to the back for the field. Exit 16. Turn right, go past one light, past Mobil station and turn left onto Judd Road. PHS is on the right. Large field borders Judd Road. Small field is at the top of the driveway on the right. Drive up driveway and park in front or in back of the school. Exit 16. Turn right, go past two lights, past Mobil station, and turn left onto Judd Road. PHS is on the right. Large field borders Judd Road. Small field is at the top of driveway on the right. Drive up driveway and park in front or in back of the school. Coming into Southbury on Rt 67, turn left onto Rt. 6 West and an immediate right onto Bucks Hill Road. Follow up hill approx. 2 1/2 mile to 4-way stop sign and turn left onto Old Waterbury Road. Follow down the hill, and turn left at traffic light. Take first left onto Judd Road. PHS is on the right. Large field borders Judd Road. Small field is at the top of the driveway on the right. Drive up driveway and park in front or in back of the school. On approaching Southbury, turn left onto Bucks Hill Road. Follow up hill approx. 2 1/2 mile to 4-way stop sign and turn left onto Old Waterbury Road. Follow down the hill, and turn left at traffic light. Take first left onto Judd Road. PHS is on the right. Large field borders Judd Road. Small field is at the top of the driveway on the right. Drive up driveway and park in front or in back of the school. On entering Southbury, get onto I84 East. Follow one exit, to Exit 16. Turn right at end of exit, go past two lights, past Mobil station, and turn left onto Judd Road. PHS is on the right. Large field borders Judd Road. Small field is at the top of driveway on the right. Drive up driveway and park in front or in back of the school. Exit 15. Turn right, go to next light, turn left onto Main Street South (opposite the Southbury Plaza, K-mart). Follow approx. 1 mile to 3rd light (at Union Square plaza) and turn left onto Peter Road. School is less than 1/4 mile on the right. Drive around the right side to the back for the fields. Exit 15. Turn left, go to third light, turn left onto Main Street South (opposite the Southbury Plaza, K-mart). Follow approx. 1 mile to 3rd light (at Union Square plaza) and turn left onto Peter Road. School is less than 1/4 mile on the right. Drive around the right side to the back for the fields. Coming into Southbury on Rt 67, turn right onto Rt. 6 East and follow to second light at Southbury Plaza (K-mart). Turn right onto Main Street South. Follow approx. 1 mile to 3rd light (at Union Square plaza) and turn left onto Peter Road. School is less than 1/4 mile on the right. Drive around the right side to the back for the fields. Rt. 6 East into Southbury. At second light in Southbury (Southbury Plaza, K-mart) turn right onto Main Street South. Follow approx. 1 mile to 3rd light (at Union Square plaza) and turn left onto Peter Road. School is less than 1/4 mile on the right. 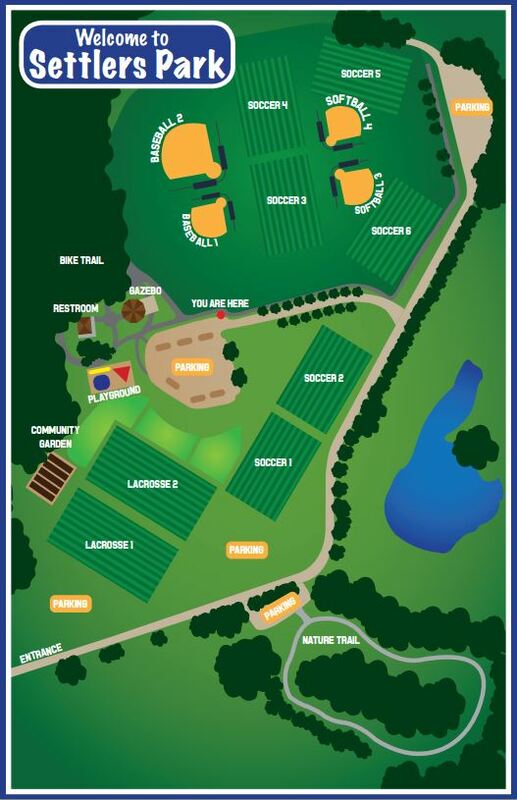 Drive around the right side to the back for the fields. On entering Southbury, at fifth light, turn left onto Main Street South (opposite the Southbury Plaza, K-mart). Follow approx. 1 mile to 3rd light (at Union Square plaza) and turn left onto Peter Road. School is less than 1/4 mile on the right. Drive around the right side to the back for the fields. 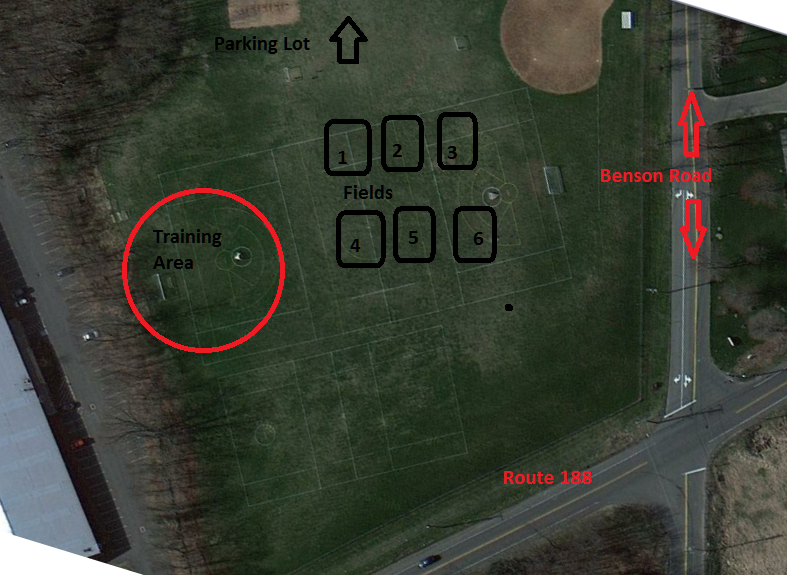 The map below is used for game assignments for Saturday morning programs only. Field assignments are included on your Pre-Kickers or Little Kickers Team Schedule, and are also included in notification emails as well. Exit 14. Turn right, proceed straight through light and follow Route 172 north. After approx. 1 1/4 miles, turn left onto East Flat Hill Road (between Country Store and church). Park is on your right after less than 1/4 mile. Drive past park to parking area at far end. Exit 14. Turn left, proceed straight through light and follow Route 172 north. After approx. 1 1/4 miles, turn left onto East Flat Hill Road (between Country Store and church). Park is on your right after less than 1/4 mile. Drive past park to parking area at far end. On approaching Southbury on Rt 67, turn right onto Rt. 172 south (South Britain Road). Follow approx. 3 miles, turn right onto East Flat Hill Road (between Country Store and church). Park is on your right after less than 1/4 mile. Drive past park to parking area at far end. Rt. 6 East into Southbury. At second light in Southbury (Southbury Plaza, K-mart) turn right onto Main Street South. Follow Main Street South approx. 2 miles to Route 172. Turn right onto Route 172 north. After approx. 1 1/4 miles, turn left onto East Flat Hill Road (between Country Store and church). Park is on your right after less than 1/4 mile. Drive past park to parking area at far end. On entering Southbury, at fifth light, turn left onto Main Street South (opposite the Southbury Plaza, K-mart). Follow Main Street South approx. 2 miles to Route 172. Turn right onto Route 172 north. After approx. 1 1/4 miles, turn left onto East Flat Hill Road (between Country Store and church). Park is on your right after less than 1/4 mile. Drive past park to parking area at far end. Exit 15. (Turn right off the exit from 84 West, Turn left off the exit from Route 84 east). Follow US-6/CT-67 towards Woodbury for 1.5 miles. Take a left at traffic light following Route 67. Take your next left after .1 miles onto CROOK HORN RD. Drive .2 miles to Settlers Park. Take Exit 15 (Turn right off the exit from 84 West, Turn left off the exit from Route 84 east). Follow US-6/CT-67 towards Woodbury for 1.5 miles. Take a left at traffic light following Route 67. Take your next left after .1 miles onto CROOK HORN RD. Drive .2 miles to Settlers Park. Rt. 6 East into Southbury. At the light where Route 6 and 67 meet take a right onto Route 67. Take your next left after .1 miles onto CROOK HORN RD. Drive .2 miles to Settlers Park. Go about 1.5 miles up Route 67 towards Woodbury after passing under the Exit 15 entrance onto I-84. Take a left at a traffic light following Route 67. Take your next left after .1 miles onto CROOK HORN RD. Drive .2 miles to Settlers Park. Dirt & gravel; two separate parking lots are available, or you may park on UNCUT grass. IMPORTANT: Please do not park on or along any roads or driveways at this location, or on cut grass. Exit 15.Â (Turn right off the exit from 84 West, Turn left off the exit from Route 84 east). Follow US-6/CT-67 towards Woodbury for 1.5 miles. Take a left at traffic light following Route 67. Take your next left after .1 miles onto CROOK HORN RD. Drive .2 miles to Settlers Park. Google Maps link isÂ here.